OSU’s own Dr. Andony Melathopoulos has just garnered a most prestigious award. Andony will be in the U.S. Botantical Gardens, Washington, DC next week to receive the 2018 NAPPC Pollinator Advocate award 2018 NAPPC Pollinator Advocate award (NAPPC = North American Pollination Protection Campaign). 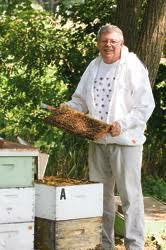 The award recognizes Andony as an entomologist with a passion for promoting bee health and educating growers, forest landowners, landscapers, the general public, and pesticide users. He has worked with various stakeholders to make tremendous strides in helping develop a strategic plan to promote the health of both wild and managed bees in the State of Oregon. In 2017, he was instrumental in the creation of the Oregon Bee Project, a multi-agency initiative aimed at protecting bees from pesticide exposure, increasing habitat, reducing impacts of diseases and pests on bees, and expanding understanding of the bees of Oregon. As part of this initiative, Andony has trained 163 individuals and formed 10 regional volunteer groups to collect and pin bees for the Oregon Bee Atlas. For Pollinator Week 2018, he coordinated 20 events across the state. He has also produced 50 episodes of PolliNation Podcast, which feature special guests and highlight issues bees face. Since September 2016, Andony has personally presented to more than 2,500 pesticide applicators on practices to minimize pesticide exposure risk to bees (language from our nomination letters). CONGRATULATIONS ANDONY. Andony is the U.S. Pollination advocate awardee this year. NAPPC also annually honors Pollination advocates in Canada and Mexico, plus recognizes Farmer-Ranchers in U.S. (John and Nancy Hayden of The Farm Between in Jeffersonville, VT) and Canada (Cody Straza and Allison Squires of Upland Organics, Wood Mountain, Saskatchewan) and a business (Francis Ford Coppola Winery, Geyserville, California) and roadside pollinator advocate (Illinois Department of Transportation). NAPPC, established 21 years ago, is a collaborative body of diverse partners, including respected scientists, researchers, private sector stakeholders, conservationists and government officials working to find common ground on innovative initiatives that benefit pollinators. The mission of P2 (as we call ourselves) is to promote the health of pollinators, critical to food and ecosystems, through conservation, education, and research. On a personal note: I have been part of NAAPC from its beginning and am member of the Honey Bee Working group. I, along with Dr Jamie Ellis of U FL and my replacement at UD, Dr Debbie Delaney, are working on a BEE MD program (part is already on the NAPPC website), a field diagnosis tool for bee issues in the apiary and colony. Visit www.pollinator.org for more information.